North Georgia’s mountain music pickers and singers flock to the Dahlonega Gold Museum State Historic Site every Saturday from April through October from 2:00 pm - 5:00 pm. Mountain style musicians are invited to participate in the Appalachian Jam - it's open to all! 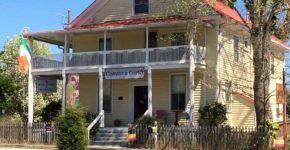 The Cork & Canvas Wine Shop & Art Gallery hosts Americana Music Jam the 1st Saturday of every month from 2-5 and Irish Music every 2nd Saturday. The Crimson Moon Cafe is housed in the nationally registered circa 1858 Parker-Nix Storehouse and offers a intimate ‘dinner theatre’ style entertainment experience in a 75 seat venue offering live acoustic performances by artists playing the finest Blue Grass, Celtic, Contemporary/World Folk, Blues, Pop, Folk-Rock, and Country. The Historic Holly Theater is also home several concerts a year from the Mountain Music & Medicine Show to Riders In The Sky and Banks & Shane, plus tribute bands like The Return (Beatles) and Satisfaction (Rolling Stones) and Jim Curry (John Denver). 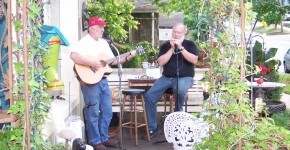 In addition, you can hear live music at many of the local restaurants in Dahlonega. 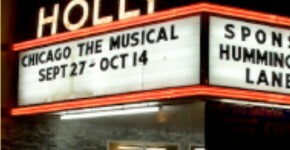 The Historic Holly Theater is home to one of Georgia's top performing theater companies. Located just off the beautiful Dahlonega town square, The Historic Holly Theater National Historic site is a fully renovated movie theater built in 1946. The Holly Theatre Company presents a year-round season of classic plays and Broadway style musicals. The theatre’s outstanding performances, from the main stage to concerts, sell out regularly to audiences who travel from throughout the region to incorporate a live show into their weekend B&B or cabin plans. The 2016 main stage season: Cabaret, 9 to 5, Shrek the Musical, You Can't Take it With You and 'Twas the Night Before A Christmas Carol (written by Long Mountain Lodge owner Tim Quigley). Dahlonega, Georgia is located on top of the largest gold deposits found east of the Mississippi River in the USA. Most of the gold that could be mined economically has been removed from the earth starting in 1828 when gold was first discovered. The earth below Dahlonega contains many tunnels dug out by miners since 1829. You can tour some of these old gold mine tunnels, plus many more attractions in Dahlonega. 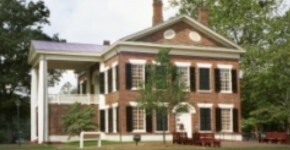 The building was restored by the state of Georgia as a State Historic Site and adapted for use as the Gold Museum and is one of the most visited Historic Sites in the state. The Dahlonega Courthouse Gold Museum offers visitors a look at the mining history of Georgia. A 23-minute film describes the mining techniques and lifestyles of the prospectors through interviews with members of long time mining families of the area. 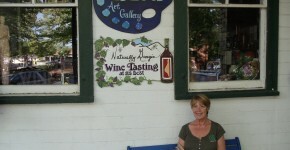 The Dahlonega downtown and surrounding area has numerous art galleries and most are open daily.. Dianne is seated in front of one of our favorites - Blu Gallery on the square.